Hydrochlorothiazide is a thiazide diuretic. Thiazides affect the renal tubular mechanisms of electrolyte reabsorption, directly increasing excretion of sodium and chloride in approximately equivalent amounts. Indirectly, the diuretic action of Hydrochlorothiazide reduces plasma volume, with consequent increases in plasma renin activity, increases in aldosterone secretion, increases in urinary potassium loss, and decreases in serum potassium. The renin-aldosterone link is mediated by angiotensin II, so co-administration of anangiotensin converting enzyme (ACE) inhibitor tends to reverse the potassium loss associated with these diuretics. 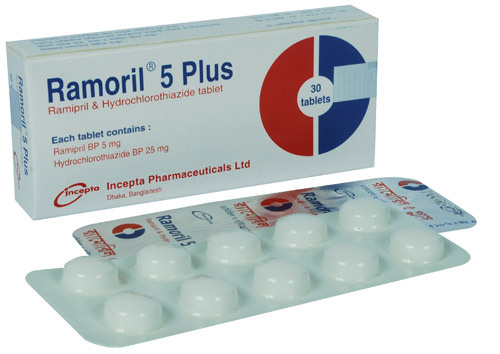 Ramoril 2.5 Plus & Ramoril 5 Plus is indicated for the treatment of hypertension. A patient whose blood pressure is not adequately controlled with Ramipril (or another ACE inhibitor) alone or with Hydrochlorothiazide (or another thiazide diuretic) alone may be switched to combination therapy with Ramoril 2.5 Plus or Ramoril 5 Plus. 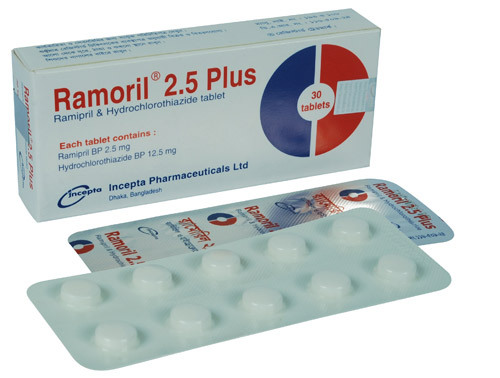 The usual starting dose of Ramoril 2.5 Plus or Ramoril 5 Plus is one tablet once daily. If necessary, the dose may be increased to two tablets of Ramoril 2.5 Plus or Ramoril 5 Plus once daily. Dosage in renal impairment: In patients with a creatinine clearance between 60 and 30 ml/min, treatment should be initiated with Ramipril 1.25 mg monotherapy. If blood pressure is not adequately controlled, the dose of Ramipril may be increased to 2.5 mg. If blood pressure is still not controlled, patient may be switched to one tablet of Ramoril 2.5 Plus once daily. Dosage may be titrated upward to Ramoril 5 Plus until blood pressure is controlled. This drug is generally well tolerated. dizziness, headache, fatigue and asthenia are commonly reported side-effects. Other side-effects occurring less frequently include symptomatic hypotension, cough, nausea, vomiting, diarrhea, rash, urticaria, oliguria, anxiety, amnesia etc. Angioneurotic edema, anaphylactic reactions and hyperkalemia have also been reported rarely. Ramoril 2.5 Plus or Ramoril 5 Plus should be used with caution in patients with impaired renal function, hyperkalemia, hypotension, surgery/anesthesia and impaired hepatic function.